Thorax: Black with Yellow on its sides. Abdomen: Yellow with Black bands. 2 pairs of membranous wings. Between 10 – 20 are laid in cells inside the nest. Larvae – legless grubs are fed in the cells by workers on insects and spiders while the queen continues to lay eggs. These develop in around 4 weeks. Up to a 1000 throughout the summer can be laid by the queen. Pupae – these develop in about 2 weeks with in the cell. Once hatched the sterile female workers continue to help build the nest and feed the larvae. Adults – Towards the end of the summer the queen lays more eggs which produce male wasps called drones and fertile females which will be the queens of next year’s nests. These swarm out of the colony and mate. The males die shortly afterwards. At the end of autumn the wasp nests die and the only wasps left alive are the young mated queens which hibernate for the winter. It is not uncommon to find hibernating queen bees in and around your home throughout the winter. Usually nest in wall cavities, lofts, hollow trees and bushes. Nests are made from wood (paper) which is chewed from trees, reeds or garden fences mixed with saliva. They are produced each year and are set horizontally. The colony size can be up to as many as 25,000 individuals with around 10,000 of these being workers. They feed on fallen fruit, nectar and carrion, but mostly catching other insects. 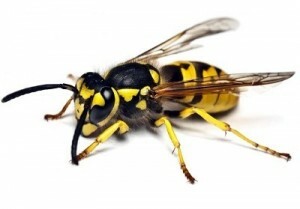 Common wasps will also attempt to invade honey bee nests to steal their honey. A sting may introduce a condition known as anaphylactic shock (an extreme reaction to the toxins in the wasps’ venom) which if not medically treated can result in death. Their venom contains a pheromone which acts as an alarm causing other wasps to become more aggressive when a wasp has stung something or has been killed. Do not try to block up the hole from the outside as this can trap and anger the wasps and lead to them trying to find a way out through your premises. Later in the season as larval rearing is reduced the adults search for sweeter substances. Wasps also become more irritable as the cooler weather sets in.